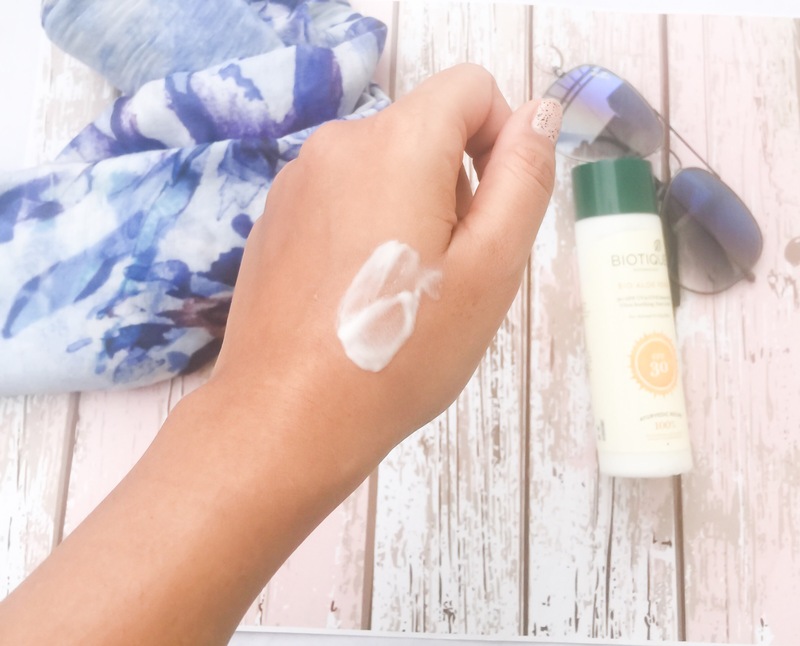 I cannot emphasize upon the fact how important is sunscreen in our day to day lives. 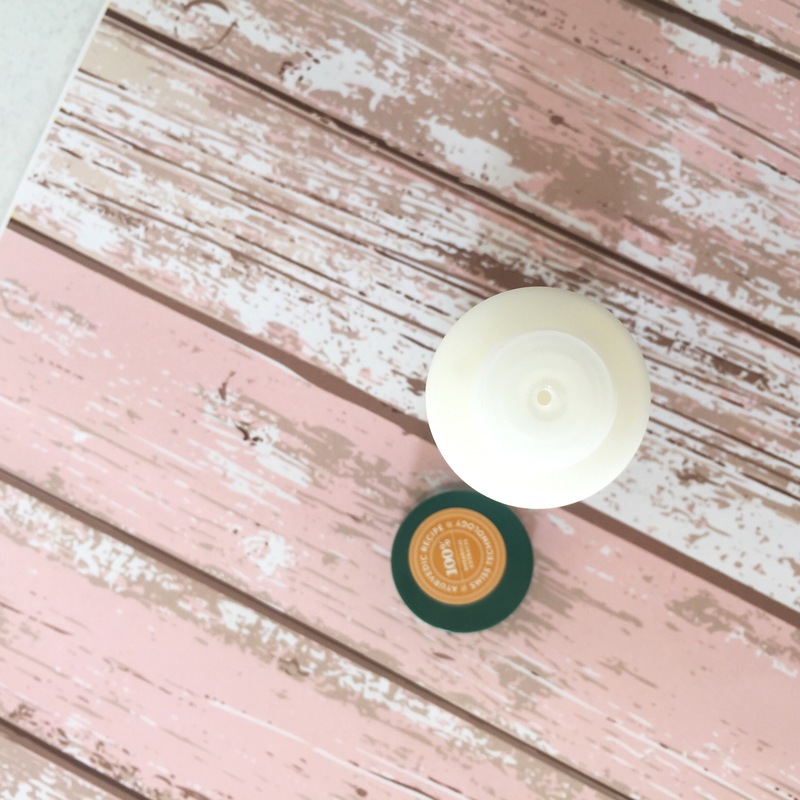 This one step should never (never ever) be avoided in a skincare routine, no matter what! I am always on a hunt for that perfect sunscreen which shall stay with me forever. 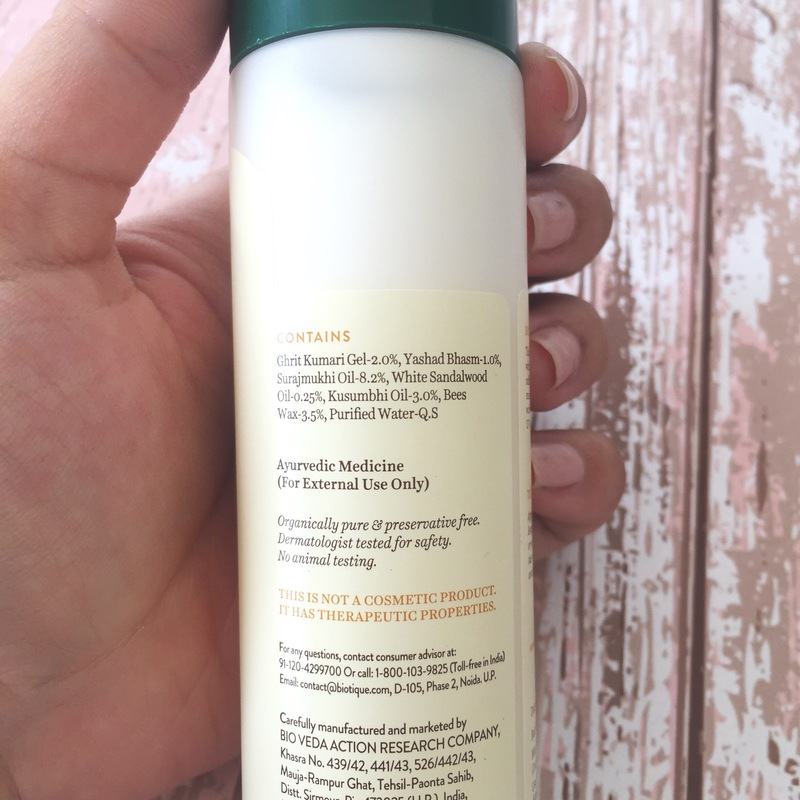 On that quest, I came upon Biotique Bio Aloe Vera Ultra Soothing Face Lotion and thought of giving it a try. Read my review to know more about it. Price: ₹290 for 120ml product (quite affordable!!) and has a shelf life of 3 years. Packaging: It has a very basic tube packaging with a little opening at the top. The bottle is a little stiff and has to be pressed hard to get the product out. 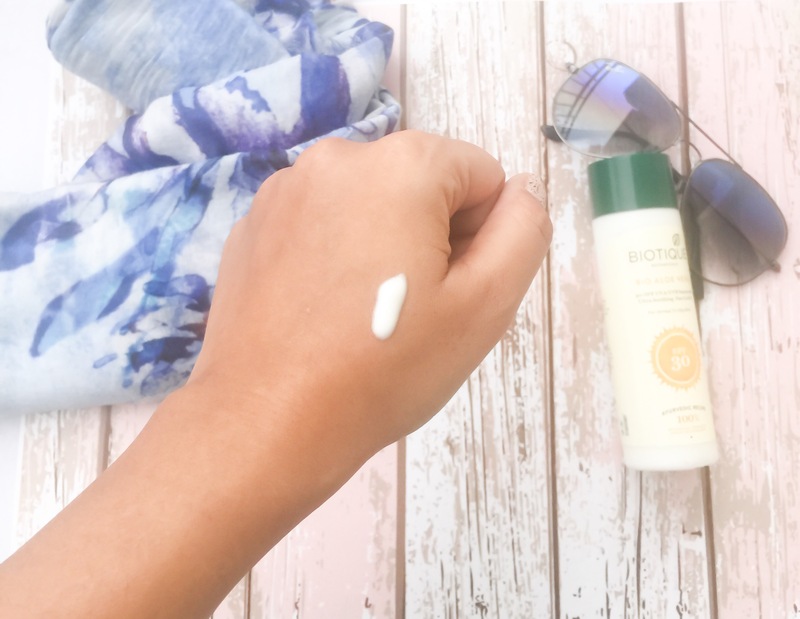 Texture: As rightly mentioned, Biotique Bio Aloe Vera Ultra Soothing Face Lotion has the texture of a lotion. It is very light almost gel like. 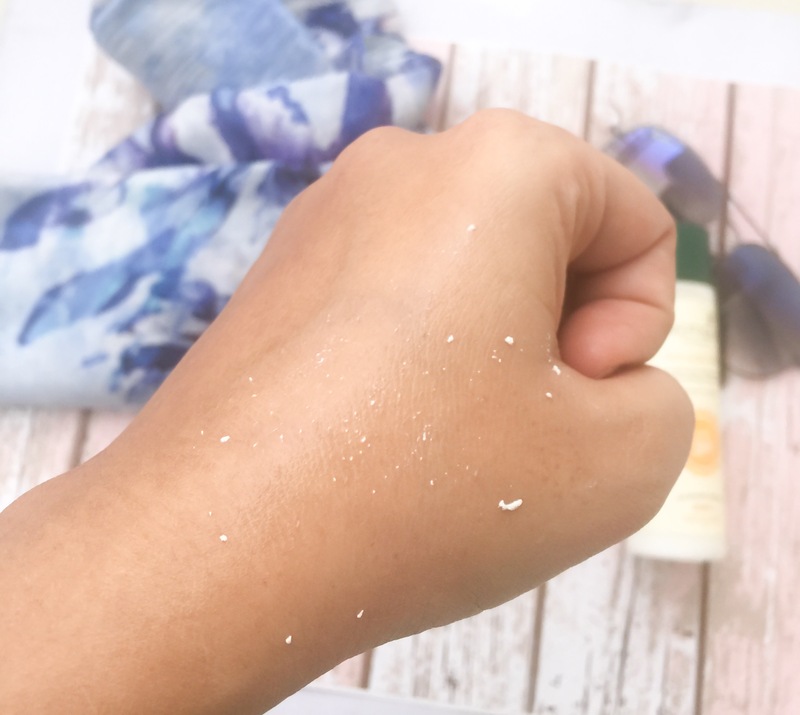 Despite such amazing texture, it takes time to completely absorbed into the skin and until the time it gets absorbed, it leaves a shiny layer on the face. (Which disappears after some time). Hence this will suit dry skinned people as well as it doesn’t have mattifying properties. Ingredients: The good thing is that it is made up of just 7 ingredients. And the bad thing is I can’t really make out how these ingredients are going to protect me from the sun? Let me break down the ingredients so that you too can figure it out. Kusumbhi Oil 3%-(Safflower oil) Has the capability of unclogging pores and fights acne because of the presence of high linoleic acid. Also, it improves the overall texture of the skin. Bees Wax 3.5%-Is an excellent humectant, rejuvenates the skin and doesn’t clog the pores. This is how it balls up, sometimes! 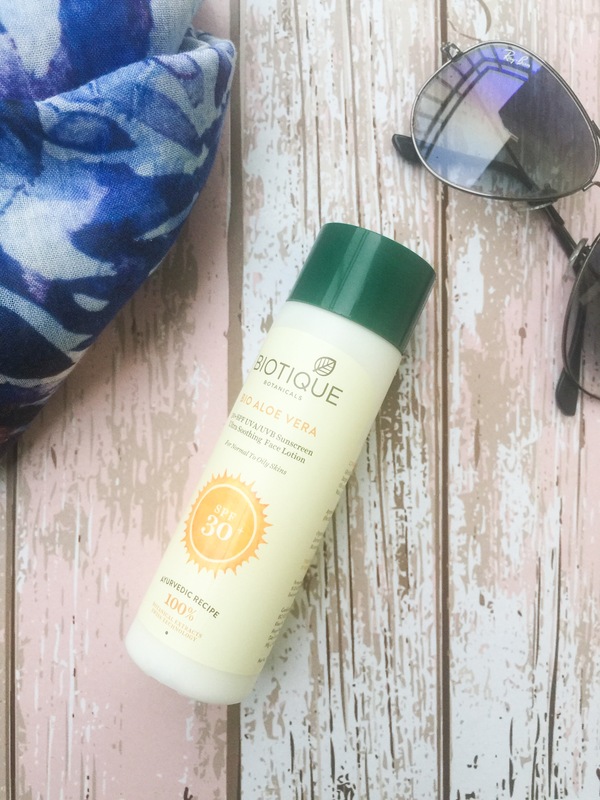 Do I recommend Biotique Bio Aloe Vera Ultra Soothing Face Lotion? For a sunscreen, NO! But this can work wonderfully as a face moisturizer even for acne prone skin as the ingredients are non-comedogenic. Nice and honest review. I too used this and felt the same. Not good for sun protection but can be used as a moisturizer…. I am so glad I am not alone!! ‘great review. I didn’t use it for the reason it’s a lotion and not apt for my oily. Then you saved yourself some money! Such products can totally be skipped. True the ingredient list doesn’t look like it has any sun screening properties. Gr8 that you wrote to the brand as well. I have dry skin and I don’t think I will like a shiny layer on my skin as well. I don’t know when will some brands start taking their products seriously!! Thank you for stopping by dear. I actually mean it 🙂 You deserve so much love! Your efforts to explain each and every ingredient is commendable. More ppl should start doing reviews like this specially for skincare products. Thanks for inspiring me and saving me from this product..